Charles Tyson Yerkes (/ˈjɜːrkiːz/ YUR-keez; June 25, 1837 – December 29, 1905) was an American financier. He played a major part in developing mass-transit systems in Chicago and London. Yerkes was born into a Quaker family in the Northern Liberties, a district adjacent to Philadelphia, on June 25, 1837. His mother died of puerperal fever when he was five years old and shortly thereafter his father was expelled from the Society of Friends for marrying a non-Quaker. After finishing a two-year course at Philadelphia's Central High School, Yerkes began his business career at the age of 17 as a clerk in a local grain brokerage. In 1859, aged 22, he opened his own brokerage firm and joined the Philadelphia stock exchange. By 1865 he had moved into banking and specialized in selling municipal, state, and government bonds. Relying on his bank president father's connections, his political contacts, and his own acumen, Yerkes gained a name for himself in the local financial and social world. However, while serving as a financial agent for the City of Philadelphia's treasurer, Joseph Marcer, Yerkes risked public money in a large-scale stock speculation. This speculation ended calamitously when the Great Chicago Fire sparked a financial panic. Left insolvent and unable to make payment to the City of Philadelphia, Yerkes was convicted of larceny and sentenced to thirty-three months in Eastern State Penitentiary. In an attempt to remain out of prison, he attempted to blackmail two influential Pennsylvania politicians. The blackmail plan initially failed, however the damaging information on these politicians was eventually made public and political leaders including then-President Ulysses S. Grant feared that the revelations might harm their prospects in the upcoming elections. Yerkes was promised a pardon if he would deny the accusations he had made. He agreed to these terms and was released after serving seven months in prison. In 1881 Yerkes traveled to Fargo in the Dakota Territory in order to obtain a divorce from his wife. Later that year, he remarried and moved to Chicago. There, he opened a stock and grain brokerage but soon became involved with planning the city's public transportation system. In 1886, Yerkes and his business partners used a complex financial deal to take over the North Chicago Street Railway and then proceeded to follow this with a string of further take-overs until he controlled a majority of Chicago's street railway systems on the north and west sides. Yerkes was not averse to using bribery and blackmail to obtain his ends. In an effort to improve his public image, Yerkes decided in 1892 to bankroll the world's largest telescope after being lobbied by the astronomer George Ellery Hale and University of Chicago president William Rainey Harper. He had initially intended to finance only a telescope but eventually agreed to foot the bill for an entire observatory. He contributed nearly $300,000 to the University of Chicago to establish what would become known as the Yerkes Observatory, located in Williams Bay, Wisconsin. Yerkes embarked upon a campaign for longer streetcar franchises in 1895, however Illinois governor John Peter Altgeld vetoed the franchise bills. 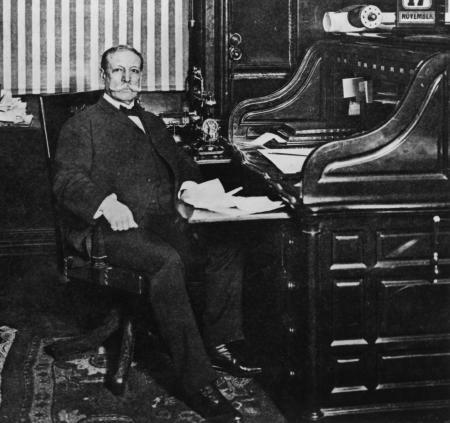 Yerkes renewed the campaign in 1897, and, after a hard-fought battle, secured from the Illinois Legislature a bill granting city councils the right to approve extended franchises. The so-called franchise war then shifted to the Chicago City Council—an arena in which Yerkes ordinarily thrived. A partially reformed council under Mayor Carter Harrison, Jr., however, ultimately defeated Yerkes, with the swing votes coming from aldermen "Hinky Dink" Kenna and "Bathhouse" John Coughlin. In 1899, Yerkes sold the majority of his Chicago transport stocks and moved to New York. In August 1900, Yerkes became involved in the development of the London underground railway system after riding along the route of one proposed line and surveying the city of London from the summit of Hampstead Heath. He established the Underground Electric Railways Company of London to take control of the District Railway and the partly built Baker Street and Waterloo Railway; Charing Cross, Euston and Hampstead Railway; and Great Northern, Piccadilly and Brompton Railway. Yerkes employed complex financial arrangements similar to those that he had used in America to raise the funds necessary to construct the new lines and electrify the District railway. In one of his last great triumphs, Yerkes managed to thwart an attempt by J. P. Morgan to enter the London underground railway field. Yerkes died in New York 1905, of kidney disease. The events of Yerkes' life served as a blueprint for the Theodore Dreiser novels, The Financier, The Titan and The Stoic, in which Yerkes was fictionalized as Frank Cowperwood. The crater Yerkes on the Moon is named in his honor. Yerkes and his wife Mary were painted by his favorite artist Jan van Beers (National Portrait Gallery, Washington DC). His wife, the daughter of Thomas Moore of Philadelphia, was also painted in 1892 by the Swiss-born American artist Adolfo Müller-Ury (1862–1947). In 1893 Müller-Ury painted from miniatures portraits of Yerkes' Quaker grandparents, Mr and Mrs Silas Yerkes. ^ a b c d The Economist (2014). ^ a b c "Charles Tyson Yerkes - American financier". Encyclopedia Britannica. ^ "The Dream City: Invasion of Cupid's Realm ("The Wasp's Nest")". columbus.gl.iit.edu. The Economist (December 20, 2014). "Conquistador of Metroland". www.economist.com. The Economist Newspaper Limited. Retrieved January 7, 2016. Franch, John (2008). Robber Baron: The Life of Charles Tyson Yerkes. University of Illinois Press. ISBN 978-0252075179. OCLC 62679786. Harlan, Homer Charles (1975). Charles Tyson Yerkes and the Chicago Transportation System. University of Chicago, Department of History. OCLC 31237397. Sherwood, Tim (2009). Charles Tyson Yerkes: Railway Tycoon. The History Press. ISBN 978-0752446226. OCLC 191810493. Wikimedia Commons has media related to Charles Yerkes. This page was last edited on 23 March 2019, at 20:08 (UTC).